It’s a big weekend ahead for me, with two book signings and lots of holiday decorating to do around the house. I love putting together holiday containers for outside my front door, so I thought it would be fun to do a mini-container to take with me this weekend to spruce up my table at the signings. The first event is from noon to 4 at the Warden House in Stillwater, where I will be one of several authors signing books of regional interest. Stillwater is a fun town for shopping and wandering around—it reminds me of another terrific Minnesota town: Northfield! I hope folks will come down and check it out. The second signing is at the Minnesota History Center, where it is double discount days for members of the historical society. I’ll be hanging around on Sunday from 1:30 to 2:30 p.m. signing books. A whole bunch of the Minnesota Historical Society Press authors are being featured this weekend. Once everything was assembled, putting this together took about 10 minutes. Because it’s nice to have something to talk about with people (besides the book, of course), I put together this simple pot. The container is a small terra-cotta pot that I painted red and black, and filled with dirt. I found the reading Santa figure at Joann Fabrics for 60 percent off and he seemed like an appropriate addition. I glued a large nail to his base so he would be anchored during transport. Then, I surrounded Santa with greens, mostly from my yard, such as spruce, arborvitae, rhododendron and sedum. The boxwood and other greens came from a bouquet I purchased at the store, most of which is available for other decor. We really do not keep our house as chilly as Lola’s blanket might indicate. She watched the container decorating with interest. 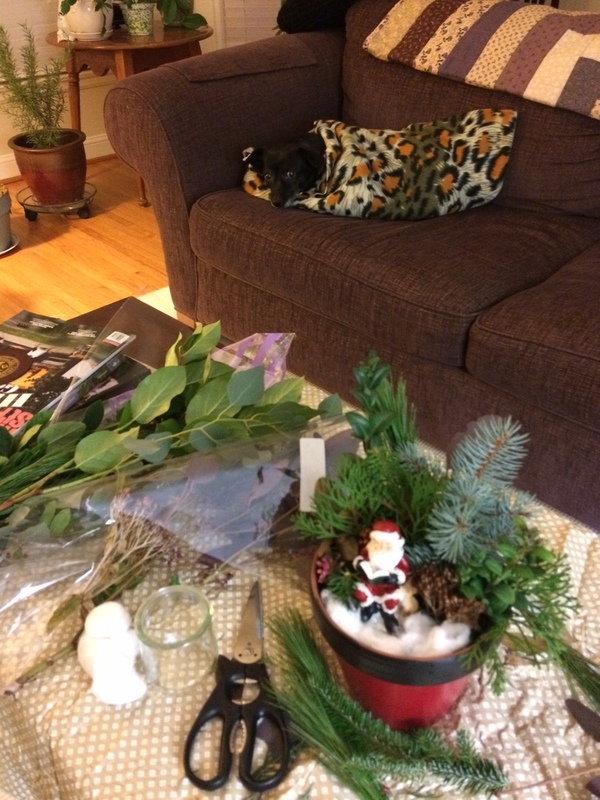 Once I had painted the pot, snipped the greens and bought the Santa, the whole project took less than 10 minutes to put together, under the watchful gaze of Lola, the dog, who is not enjoying our recent cold weather. While I like the way the pot looks, I may add a bow or something to brighten it up. I’m working on a bigger container for my porch, which I hope to get finished soon since the holidays are coming on fast. 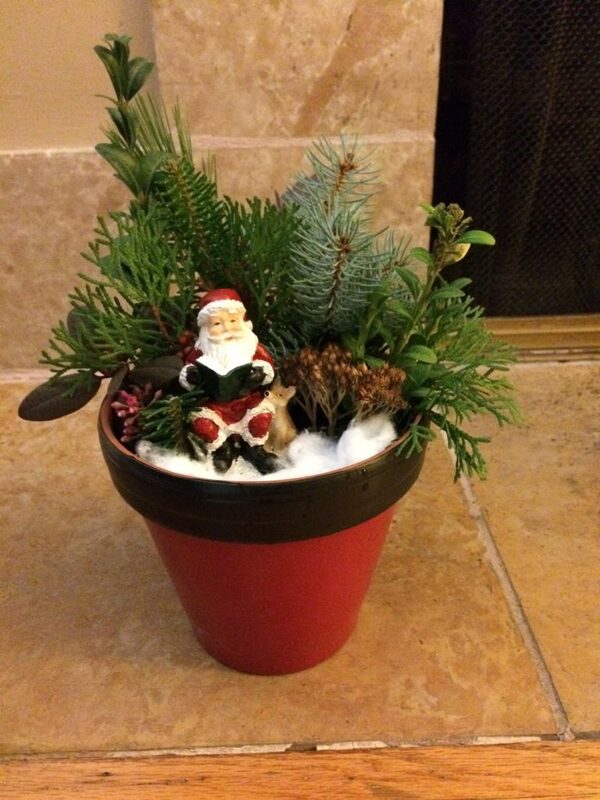 What are your favorite holiday container ideas?